“I wasn’t receiving much back,” Graber, a Southwestern College religion and philosophy major from Wichita, told junior-high students and high-schoolers at the first of three Bishop’s Confirmation Rallies on Feb. 13 in Hays, Kansas. She also told students not to give up on Christ when he doesn’t answer their prayer – or His answer isn’t what they had hoped. “Should we be limiting Jesus to just a few responses to our questions?” she asked. Graber encouraged the students to get to know Christ and to be the face of Christianity to their friends. “All of us together representing Jesus is much more stronger, more powerful,” she said. 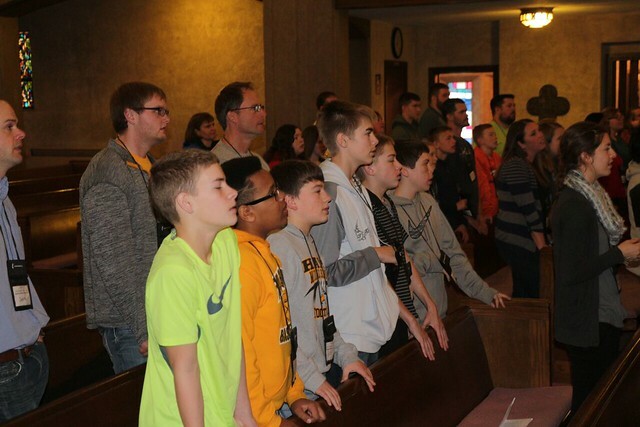 About 65 students, sponsors and clergy, representing 11 churches, gathered at First United Methodist Church in Hays for the first of three rallies across the Great Plains Conference. The latter two are Feb. 20 in Emporia, Kansas, and March 5 in Lincoln, Nebraska. In between the sessions, students learned about United Methodist scripture and tradition, what it means to be a leader and a Q&A session with the bishop, during which participants asked questions ranging from the bishop’s own spiritual life at their age to his opinion of the current presidential campaigns.